The Holy Synod of the Russian Orthodox Church held on December 25-26 its last session in 2013. The Synod granted the petition for retirement from Metropolitan Filaret of Minsk and Slutsk, Patriarchal Exarch for All Belarus, due to his reaching the age of 75. 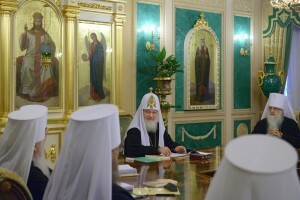 The Synod expressed cordial gratitude to him for his 35 year-long archpastoral service of Belarus marked with outstanding ecclesial achievements and appointed him Honorary Patriarchal Exarch for All Belarus with the right to participate in the work of the Synod and to occupy an honorary place at divine services and official ceremonies. His Holiness Patriarch Kirill personally thanked Metropolitan Filaret and, in recognition of his long-standing work for the good of the Russian Orthodox Church, presented him with his own pectoral icon. The Synod re-organized several dioceses and assigned new heads of metropolises and dioceses. Hegumen Arseny (Sokolov) was relieved of his duty as rector of the Parish of All Saints in Lisbon and appointed rector of the ROC representation in Beirut, Lebanon, and patriarchal representative to the Patriarch of Great Antioch and All the East. Archpriest Antony Ilyin was relieved of his duty as ROC representative to the European international organizations and put at the disposal of the Patriarch of Moscow and All Russia. Archpriest Dimitry Sizonenko, DECR secretary for inter-Christian relations, was appointed acting ROC representative to the European international organizations. The Synod adopted a new membership of the Synodal Biblical and Theological Commission and resolved to establish a Coordinating Committee for Developing Theology in the ROC. The chairman of the Synodal commission was made ex officio director of the Coordinating Center. The Synod approved the work of the ROC 7th International Theological Conference on “Modern Bible Studies and the Tradition of the Church” and pointed to the need to continue the work to translate Scriptures into vernaculars of the flock in the pastoral care of the Russian Orthodox Church. Pointing to the importance of the initiative to prepare an academic edition of the Slavonic Bible, the Synod stressed that the work to study and translate Scriptures should be monitored by the Synodal Biblical and Theological Commission. Concerning the ROC’s international work and inter-Orthodox relations, the Synod expressed “serious concerned over the continued persecution and discrimination of the Christian population in many countries of the Middle East and North Africa, accompanied with killings, taking of hostages, burning of churches and houses, threats of reprisal and coercion to change one’s faith” and deemed it necessary “to continue intensive actions to draw the attention of the world public to the tragic situation of Christians in the Middle East and North Africa and to promote a peace settlement of the conflicts through interreligious and international dialogues”. Among liturgical decisions, the Synod approved the Rite of Prayer Service during natural and man-made disasters. Provision for the Russian Orthodox Church Army Clergy in the Russian Federation.